As a cool drizzle greeted students stepping off school buses and into Rainier Valley Leadership Academy Thursday morning, their families and caretakers rejoiced. They had just learned their charter school was going to be just fine — for now, at least. In a ruling released Thursday morning, the state Supreme Court held that funding charter schools with lottery money does not violate the state constitution. The justices agreed to uphold most of a 2016 law that authorized the lottery money for charter schools. But they struck a provision that restricted charter schools from unionizing across schools, the way most teachers unions operate in traditional school districts. While the justices disagreed on the finer points of a complicated law, six of the nine ultimately agreed to uphold it. The lead opinion in El Centro de la Raza v. Washington was written by Justice Mary Yu. “Charter schools are not rendered unconstitutional just because they do not operate identically to common school,” she wrote. Charter-school advocates celebrated, while the state teachers union expressed its disappointment. It wasn’t immediately clear whether any of the plaintiffs planned to appeal the decision. Charter schools are publicly funded, but privately run — and they have engendered intense opposition and litigation since they were first approved to open in Washington state in 2012. Twelve such schools currently enroll about 3,500 students. A legal challenge in 2015 dealt a blow to the charter-school movement here: Justices ruled that giving money from the state’s general fund to the schools was unconstitutional. A year later, the Legislature followed up by passing the law that funds charters through lottery revenues. At the heart of the new lawsuit was the question of whether that public money can fund schools that aren’t accountable to elected boards. The plaintiffs — which include El Centro de La Raza, the statewide teachers union, the League of Women Voters of Washington and other groups — argued that the 2016 legislation was unconstitutional. The mix of opinions made it hard for even the state’s top charter-school advocates to understand the ruling’s implications. In her lead opinion, Yu rejected arguments from charter-school opponents that the schools were unconstitutional because local voters do not control them. She argued that their funding source, unlike traditional schools, does not include local property tax levies. One opinion of partial dissent, written by Justice Steven Gonzalez, echoed Yu’s overall conclusion about funding but disagreed on the collective-bargaining issue. Chief Justice Mary Fairhurst signed on to that opinion. In a separate dissent, Justice Charles Wiggins found the state’s charter-school law is unconstitutional because it gives the state schools chief only one seat on an 11-member commission that oversees charter schools. “The lead opinion attempts to trivialize the fact that the charter school act gives powers to the charter school commission and school district authorizers without giving any oversight of these powers to the superintendent,” Wiggins wrote. Justice Susan Owens joined both Wiggins’ and Madsen’s dissenting opinions. Families who enroll their children in charters say they offer smaller class sizes or more targeted instruction than they receive at their neighborhood schools. 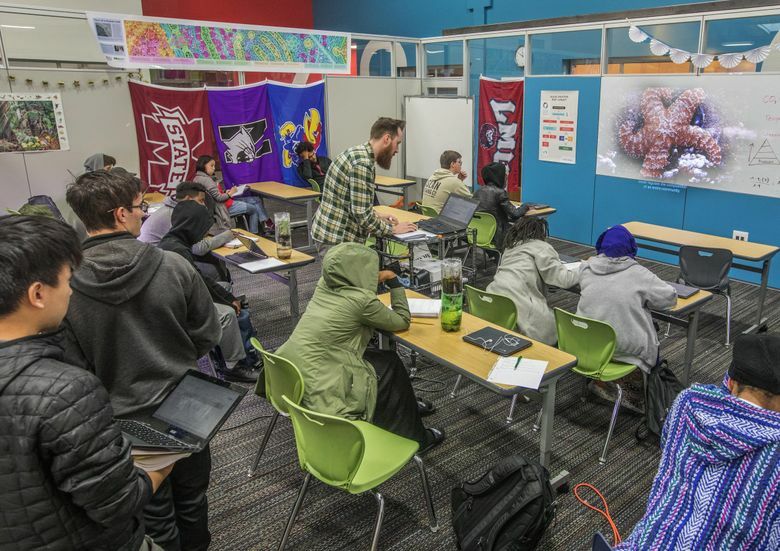 The Rainier Valley charter school serves mostly African-American and East African kids, and draws its enrollment of 275 students in grades six, seven and nine from Brighton, Hillman City, Columbia City and Rainier Beach. Matthew Grace, who volunteers to help with drop-off, has a grandson Moonie in the school’s sixth grade. As Grace spoke, Principal Walter Chen greeted each student with a fist-bump, a morning ritual. The ruling affords families a sense of legal stability, at least for now. The statewide teachers union, a plaintiff, said it had no immediate plans for pursuing further legal action. The parties have one month to file a motion for reconsideration. While some opponents in Seattle and beyond fear the ruling will encourage the creation of more charter schools, the decision doesn’t “personally” worry Leslie Harris, president of the Seattle School Board. The School Board has taken a strong stance against the growth of charter schools. In January, members passed a resolution that opposed Green Dot’s request to the city to build a school larger than zoning rules allow. School Board member Zachary DeWolf struck a different note. “While I am deeply frustrated by this decision by our state’s Supreme Court, this is the exact moment our state’s lawmakers need to get back to work to actually fully fund public education” so that parents don’t feel the need to turn to charters, he said. 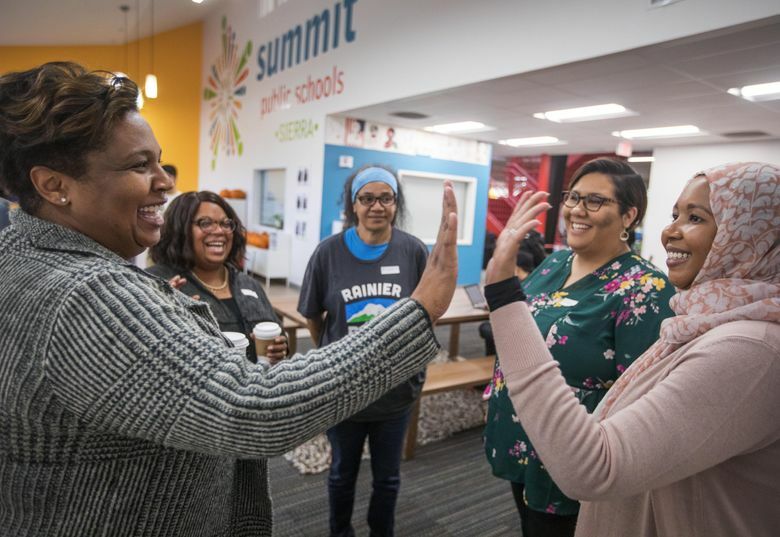 At Summit Sierra High School in the International District, Natalie Hester, a mother of two students there who also serves on the board of directors for the Washington State Charter Schools Association, greeted fellow parents with whoops and cheers. “We won!” she said. Meanwhile, it is still unclear whether charter schools could access funds from the city’s proposed Families, Education, Preschool and Promise Levy — a $600 million-plus city education levy on the Nov. 6 ballot. Washington state schools chief Chris Reykdal said he didn’t have an opinion on the ruling. Wood, of the teachers union, specifically countered the lead opinion’s ruling that charters remain publicly accountable despite not having a locally elected school board. Wood added that the union’s attorneys still needed to review what implications the ruling will have for the collective-bargaining rights of teachers who work in charters. Justices striking the bargaining provision of the charter-school law marked a partial win for the plaintiffs, who argued the restriction against unionizing made the schools unconstitutional. “Part of the charter-school model to diminish the role and economic impact of unions on schools, and [the ruling] directly addresses that,” said Paul Lawrence, an attorney for the plaintiffs. Lawrence said there are still a few scenarios that could spell future litigation.